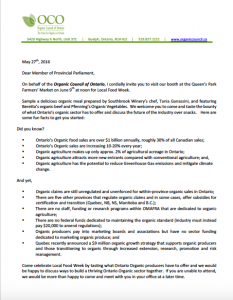 The Organic Council of Ontario is excited to attend this year’s Queen’s Park Farmers’ Market again in celebration of Local Food Week. 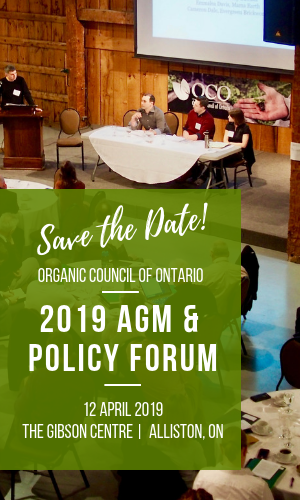 This year, in an effort to promote Ontario Organics, we have invited all MPPs to join us at the event and come meet our board members and taste the delicious samples provided by chef Tania Ganassini of Southbrook Vineyards, featuring Beretta beef and Pfenning’s organic vegetables. You can read the invitation online or by clicking on this image. Organic agriculture has the potential to reduce Greenhouse Gas emissions and mitigate climate. 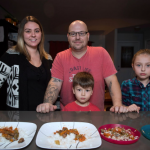 Quebec recently announced a $9 million organic growth strategy that supports organic producers and those transitioning to organic through increased extension, research, promotion and risk management.